We've put together an in-depth look at some of the Best Skateboards available right now. We've focussed on complete Skateboards here, but we've also reviewed loads of Decks if you are looking to build a completely custom Skateboard. Buying a complete skateboard allows you to get skating straight away. Typically, a complete skateboard comes pre-assembled, so you don’t have to know how to set up or grip a board in order to skate. This makes complete skateboards perfect for beginners and anyone who just wants to keep skating fun and simple. Before we get to our list of the best complete skateboards, we are going to look at all the components of a skateboard. Complete skateboards come in loads of different shapes and sizes, so which one should you pick? How much does a good skateboard cost? 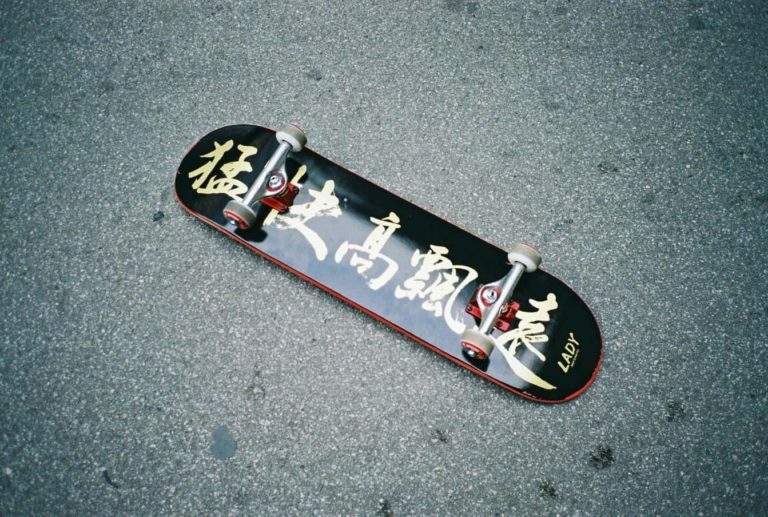 However, some complete skateboard do not come assembled so if you want to learn how to set up your board, keep reading. Each component of a skateboard plays a vital role in how the board feels and functions. While you don’t need to know this information it will greatly help you choose the board that is perfect for you and help you maintain the board after you have skated it for a while. The list of components below is as in-depth as possible. We have included every component of a skateboard plus some optional extras that can help you further your skateboarding depending on how you like to skate. If you don’t have a deck, you don’t have a skateboard. When shopping for your first board, you want something that is big enough that you have some stability, but not too big that you can’t pop it and move it easily. There is a fairly narrow margin of error for this sizing, but it can be figured out. If you are a young kid, a 7.5 is probably the best place to start, it will offer you control and stability, but you’ll still be able to pop your tricks. If you are a teenager or young adult, a 7.75 or 8 will offer the same thing. If you are an adult looking for a first board, anything from an 8 to 8.5 board may be best. Of course, this depends on the style of skating you want to do and how big your feet are, but this is a rough guide to get you started. Once you have skated for a few months and found the area you want to focus on, you can then step up or down depending on what that area of skating calls for. Grip tape goes on the top side of your board and is crucial when it comes to stability and control. The grip tape allows you to have a stable base on the board but still lets you pop your tricks. Although all grip tape looks similar, each brand actually offers different things. Mob, for example, has anti-air bubble technology that makes gripping your first board really easy. If your complete doesn’t come preassembled, get Mob grip, it is the easiest way of gripping your board, and you’ll be down the skate park in no time. The trucks on a board hold your wheels and bearings in place and allow you to turn and grind. They need to be strong, but in the early stages should be fairly lightweight too. You want trucks that are lightweight so that when it comes to popping your tricks for the first time, you actually leave the floor. All trucks can be adjusted to make turning easier or harder depending on your preferences. This is something that takes a little time to figure out, and everyone is different when it comes to how loose they have their trucks. To start, tighten your trucks so that they are loose enough that you can turn but not too loose that you don’t have any control. Wheels come in a lot of sizes, and the perfect size for you depends on what you want to skate. We ride 54 or 55mm because that provides some lovely speed at skate parks and yet still offers control for street. 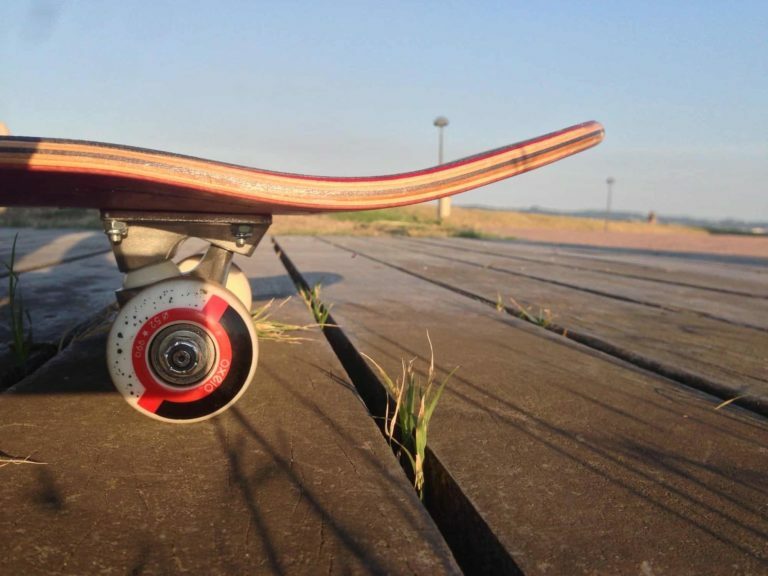 However, true street skaters may prefer 51 or 52mm wheels so that they do not get wheel-bite as often. Bowl riders, typically ride bigger wheels like 58 or 60mm as they don’t need to worry about wheel-bite as much and can focus on getting more speed. The wheels that come with your complete will be around 52 to 54mm which are perfect for finding your feet and your style of skating. From there, you can go up or down in size depending on which style of skating you enjoy the most. Bearings are the most hotly debated component of any skateboard. Which are the best, why are the best and who are they best for? Are all questions that bearings get subjected to. However, if you’re a beginner, you don’t need to concern yourself with the bearing debate just yet. Some simple ABEC 5's (likely included in your complete) will be enough for you to get some speed and control from your board without going too quickly. After that, you can join the rest of us in the quest for the perfect skateboard bearing! Bolts are often overlooked by skateboarders until they snap or fall off, then they become the most important component of your board. Bolts are available in two sizes, typically, small and large. The small bolts are perfect for attaching your trucks to your board while the larger ones are great if you like to use risers. It is worth buying a pack of bolts to go along with your new complete so that if you ever lose a bolt, you have some spare. You can also buy the nuts that hold the wheels and kingpin onto your trucks which are perfect for keeping in your bag just in case you ever lose your nuts! Riser pads are pieces of plastic that sandwich between the deck and the trucks of your skateboard. They are used to create a little more height which is great for anyone that likes loose trucks or bigger wheels. When you skate with loose trucks or bigger wheels, your wheels can often touch the bottom of your board and stop you dead. This is called wheel-bite and can be a real pain when you are trying to land a trick. Riser pads won’t put a stop to wheel-bite altogether, but they can massively help. If you think riser pads will help you, make sure you purchase some long bolts for attaching your trucks and riser pads to your board. Smaller bolts (like the ones you get with a complete skateboard) are typically too short to connect the trucks and riser pads to your board. All trucks come with bushings, bushings are the rubber bits located on the kingpin bolt that allow you to turn. Although all trucks have bushings as standard, you can buy other bushings that provide more control and stability. Bushings come in a variety of hardnesses that allow you to turn in different ways. For example, Bone bushings come in soft, medium and hard. Medium is considered the best for most types of skating, softer bushings are great for cruising, and harder bushings can be used if you like extremely tight trucks. Rails are pieces of plastic that screw onto the underside of your board and allow you to slide boardslides for longer. Typically, rails are used by bowl and pool riders that want to increase their boardslide distance without having to go a million miles per hour. However, many street skaters also use them as they work very well on ledges and rails as well as pool and bowl coping. If you are just a beginner, attaching rails to your board may make boardslides a little too fast for you, but for anyone looking to increase the speed of their boardslides and the control they have of them, rails are a great addition. Well, a good skateboard can cost anywhere from about $100 upwards really. Once you know what you like on a board, you can start to customize it and create your perfect set up. However, when you’re just starting out, you don’t know what type of trucks you like and size of wheels and that sort of thing. But that’s where complete skateboards come in. A quality complete can set you back about $80, but it gives you everything you need to skate without needing any knowledge of skateboarding. You can just skate and have fun. This is the brilliance of complete skateboards. They provide a stepping stone for beginners. When you just really want to try skateboarding but don’t know what to look for when buying a board, a complete is perfect. From there, you can then get to know the ins and outs of skateboarding and then start customizing your setups. Some skateboarders need to see a skateboard in the flesh before they buy it. Now, if you are an expert when it comes to the shapes of skateboards that may be true, but for those of us who just like to skate, buying online is perfect! All you need to know about a skateboard is its size, whether it comes with grip and how many stickers you get with it. All of this is in the description of the skateboard. It can actually be very handy for a beginner to buy online. You can sort through loads of skateboards online and find the best one for you far quicker than going around a bunch of shops. Now, it is vital that you support your local skate shop too, but buying boards online is a great way to see a massive range of boards and find the exact one you want for your next set up. Well, now you know about every component and roughly how much a complete skateboard costs, you may wondering if any complete skateboards are better than the competition. If you are, then never fear, we have skated a bunch of complete skateboards, and you can find our findings and our list of complete skateboards below. This complete from CCS comes in a wide range of colors so its perfect for the skater who wants a board that suits their style and personality perfectly. Of course, it is also an excellent board to skate. It comes with everything you need to make your local skate park your home away from home. You have a choice of three sizes with this complete, 7.75, 8.0 and 8.25. So, from beginners to experts, this complete can accommodate you all. The undercarriage of this board (the wheels, bearing, and trucks) makes this board perfect for the streets or park. The wheels are 52mm while the trucks are 139's, a great size for stability and turning. It also comes with ABEC 7 bearings, great for cruising and stacking clips! If you’re looking for a basic board that has everything you need to get started, this is the board for you! ​The only issue we could see with this board is the bearings. If you’ve ever skated Bones Reds or similar bearings, you may notice a difference with the ones supplied. For beginners though, these bearings will be perfect for finding your feet. This complete from Globe is perfect for any adults want their first set up. It comes in at 8.625 inches wide which is a bit too wide for kids, but for adults, it’s great. This size will provide all the stability and control you need to learn the basics and even more. Plus, the board has a great graphic too! This complete comes with 53mm wheels and 5.5-inch Tensor Trucks. Tensor has been in the truck game for a long time now so you are certainly getting a good set of trucks that will help with turning. The wheels are great too; the wheels have a hardness of 101a which means they are extremely robust and won’t damage easily while you are learning. If you an adult and want a stable platform to learn the basics of skating, you can’t go wrong with this board. Due to the construction of the board, this may not hold up to the abuse a seasoned skater may throw at it, but for learning the basics and a little bit more, it is brilliant. We’re throwing this old school complete board in this article as a little curve ball. This board may not suitable for most skaters out there wanting to learn the basics, but for someone wanting to learn bowl or pool basics, this could be the board for you. It is 10 inches at its widest and has 58mm wheels, perfect for maintaining speed in a bowl. It also has some good quality trucks for the tight turns of any bowls. Of course, this complete is also perfect for anyone looking for a cruiser. This massive board provides all the stability you’ll need to cruise the streets in style whether you are a beginner or not. 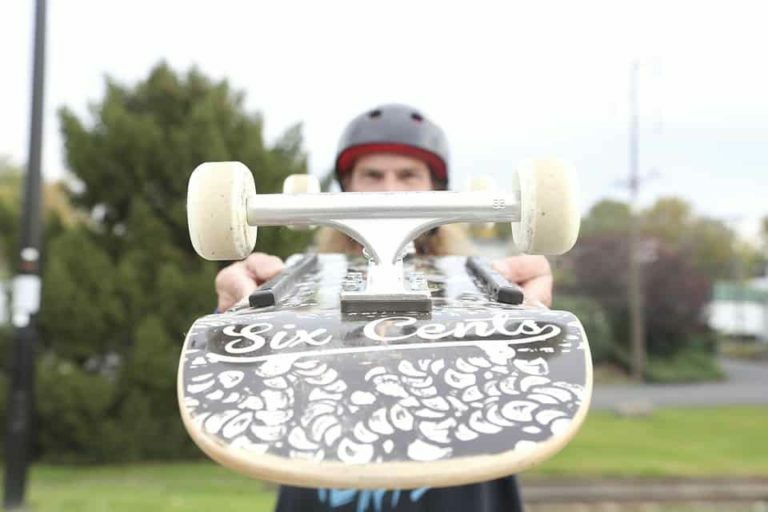 The 58mm wheels are hard park wheels so you may want to invest in some softer cruising wheel if you want to use this complete as a cruiser, but other than that this is ready to hit the streets, bowl, pool or anywhere else. ​The only con of this complete is that the trucks are not as high quality as some on this list. But for learning to carve a bowl or cruising, they should hold up just fine. This Enjoi complete comes pre-assembled ready to hit the street or park. It comes in at 7.75 inches wide, which is just the right size for a kid who wants a lot of stability or adult who wants to learn tricks. The wheels and trucks are professional quality too and will last you for a number of boards. This board is certainly one of the more visually awesome on this list. It just looks damn good and would look great at any skate park around the world. Of course, it isn’t just about looks; this complete also performs extremely well too. With this board, you’ll be able to make tight turns, skate any obstacles you may want to and further your skating in any way you choose. The only con with this board would have to be the bearings. They are not as high quality as the other parts of this complete. We would suggest investing in some new bearings for this complete and, once you do, you’ll be flying around the park! This Element complete skateboard is the perfect starter board for any young kid wanting to get into skateboarding. It is a 7.5 so will provide enough stability without being too heavy for them to learn tricks. It comes with some excellent starter trucks, bearings and wheels too. The wheels are 52mm which is a perfect size for speed and control, and the ABEC 5 bearings will keep them going at the park but won't provide too much speed that they get scared. Overall, this board is perhaps one of the best completes on here for starting out. It comes with everything you need to get started including riser pads, bolts, grip tape and all the major components. Plus, it comes pre-assembled, so it’s good to go straight out the box! Only comes in one size. While this complete is perfect for kids, it isn’t suitable for adults wanting to learn how to skate. This Mini Cab board is another complete that is perfect for the younger skater. It is professionally made by one of the longest standing skate companies in the world and comes with everything your kid needs to have a blast at the park. The deck is 7.5 inches, but the wheelbase is only 12.25 inches. This means that the board is slightly smaller than normal meaning smaller kids can have much more control of their tricks while still being stable. The bearings and wheels in this bundle are also very high quality. The wheels are 53mm so they are great for street, park or learning the basics of transition. If your kid is very young and they want to learn tricks, this is probably the best board for them on this list. As it is smaller than a normal board, they can reach trick positions with their feet while always being stable and under control. The only con to this board is the trucks, they aren't the highest quality available. However, a beginner doesn’t need the highest quality trucks in the world. These trucks will give them the stability and control they need to learn new tricks and master controlling the board. This Darkstar complete comes with a 7.75-inch board, 52mm wheels and everything else a beginner needs to start riding a board comfortably. The size of this board makes it perfect for slightly bigger kids and adults. It will provide a stable platform to learn how to push, kick-turn and even the basic tricks. Darkstar makes very good quality boards and has a great team of skaters to show for it. However, in recent years, they decided to drop their prices and focus on the beginner market. This drop in price didn’t mean a drop in quality either. They still provide some incredible boards just at very affordable prices! The bearings are slow! They may help you find your feet and get stable on the board, but once you start hitting obstacles, you’ll need to invest in some better bearings. This Chocolate complete is very similar to the Element board featured in the list above. In fact, the only difference is the deck itself. This board is a Chocolate, a very high quality skateboard which comes in at 7.75 inches wide. This size, as we’ve said throughout this article, is perfect for teenagers and adults wanting a first board. It will provide all the control you need and be ready to learn tricks when you are. All the other components of this complete are really high quality too. You get lightweight Core trucks, 52mm TGM wheels and ABEC 5 Amphetamine bearings. All this adds up to an excellent complete for anyone wanting to take their first pushes on a board. This complete will last you a long time if you’re just starting out, go and grab one and get skating! This complete does arrive un-assembled which is to keep the costs down, but some beginners may find that scary. ​Most of the Skateboards above come pre-assembled, but for any that don't, fear not as assembly is quite easy. There are plenty of “how to set up a skateboard” videos online if you get stuck like this one from Andy Schrock. The 2 completes below are our current favorites for different reasons. This topic can be rather subjective, however, we think the Deck on this Plan B complete has really great concave, giving the board excellent pop, helping you pop those Ollies that little bit higher. This complete, once again, has some extremely professional component included in the price. You get ABEC 5 Amphetamine bearings, 52mm TGM wheels and Core trucks which make a great undercarriage that provides a lot of stability and control. You also get riser pads included in this bundle, but unless you skate very lose trucks, these may not be required. The ABEC 5 bearings that come with this complete may be slow for some more advanced skaters, but for finding your feet, they are invaluable! As are the wheels and the trucks! However, it is the deck of this complete that makes it one of the best on the market at the moment! The deck is a Chris Cole Plan B deck that’s 8 inches wide and has a lovely concave and shape. This size is great for any teenagers or adults wanting to learn how to skate, and the pop on this board will help you learn tricks nice and easily. If you want to learn tricks, this is the complete for you. Again, looks will nearly always come down to personal preference and there may be other boards on this list that you prefer to this, but we think this Birdhouse looks amazing. We absolutely love the look of this Birdhouse complete! The graphic is the best on this list, and the black trucks and white wheels really bring it all together nicely. We know that a skateboard isn’t just about looks, but a great looking board can give you the confidence you need to start nailing tricks! However, this complete is certainly not all style and no substance. It may be the best looking complete on this list, but it’s also one of the best. The deck of this complete comes in at 8 inches wide, perfect for adults, teenagers and anyone who fancies a very stable base for learning the tricks of the trade. It also comes with trucks, wheels, bearings, hardware, and grip all set up ready to go. So, once this complete hits your doorstep, you’re ready to get to the skate park straight away and learn in style! There are so many skateboards to choose from (which is a good thing) that it may take a while for you to find your personal "best skateboard" or "favourite skateboard". Use this list as an informative reference to help you find the perfect setup. 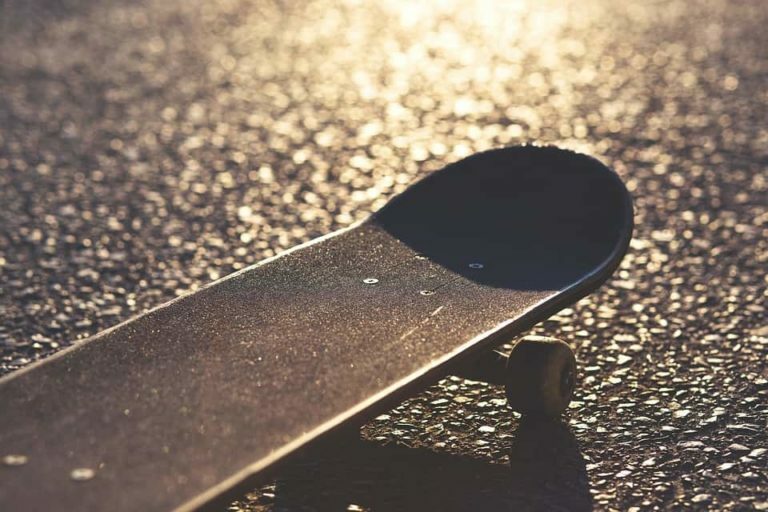 Most of the brands on this list will produce hundreds of different styles of skateboard, in many different shapes and sizes, so you should be able to find something that suits your style perfectly. While most of these skateboards come assembled, remember that assembling a skateboard isn't that difficult, so don't be put off by buying individual parts and assembling your perfect board. Let us know in the comments what your favourite skateboard is and why you think it is the best.